Will Shark Attacks In North Carolina Be A Concern Again This Year? Shark Week may start Sunday on the Discovery Channel, but it would appear that shark season has already begun on the East Coast. On Saturday, an 11-year-old boy was bitten by a shark while surfing in Atlantic Beach, North Carolina, exactly two weeks after a similar attack at the same location. It's the same state that experienced an unusually high number of shark attacks last year, which could cause concern over the potential for shark attacks in North Carolina this summer. In 2015, there were a record-breaking 98 shark attacks worldwide, according to the International Shark Attack File (ISAF). Of those attacks, 59 occurred in the U.S., with more than half — 30 to be exact — happening in Florida. North Carolina had the second-highest number of attacks, with a record-breaking eight incidents occurring in the state in the summer of 2015. Three attacks occurred along the northern part of the coast in the Outer Banks, while the remaining five incidents occurred further south. No fatalities occurred as a result of the North Carolina attacks, but two teenagers each lost one of their arms. Last year's shark attacks led to widespread concern over the migration patterns of sharks and the seemingly increasing potential for encountering one, particularly in North Carolina. Now, the sharks are back, and experts have warned that 2016 could be just as dangerous as 2015. On June 11, an 18-year-old man was bitten by a three-foot shark at Atlantic Beach, a popular spot for surfers. The man suffered injuries to his hands and wrist. That incident occurred just days after a close call for a surfer in South Carolina. There, a 27-year-old man said a shark took a bite out his surfboard while he was in the water near Charleston. Luckily, he was not injured. Back in Atlantic Beach, an 11-year-old boy was bitten by a shark on Saturday. He had been surfing near the spot where the other attack occurred two weeks earlier. The boy suffered what law enforcement called "deep wounds" to his left foot. As locals and visitors plan trips to the beach this summer, particularly along the East Coast, experts have warned that shark encounters could be the new norm. Mind you, they're still incredibly rare — and rarely deadly. Last year, lightning and dogs each killed more people than sharks, according to ISAF. Still, warmer waters mean that the potential is there. Back in March, it was already clear that shark bites could be a concern again this summer. As The Virginian-Pilot reported at the time, record high temperatures over the winter and warmer-than-average temperatures since have caused sharks to begin migrating north from Florida earlier in the year than usual. Warmer waters also make the beach more appealing to people, which could cause humans and sharks to encounter one another more often. Sure enough, a great white shark has already been tagged off the coast of Cape Cod in Massachusetts. There, the first great white of the season was tagged last week. That sighting seems to suggest that sharks have indeed already begun to migrate north. Despite the higher number of attacks last year, sharks don't seem to be scaring too many people away from the beach — and they shouldn't. Incidents remain rare, and beachgoers can take several precautions to lessen their chances of an attack even further. 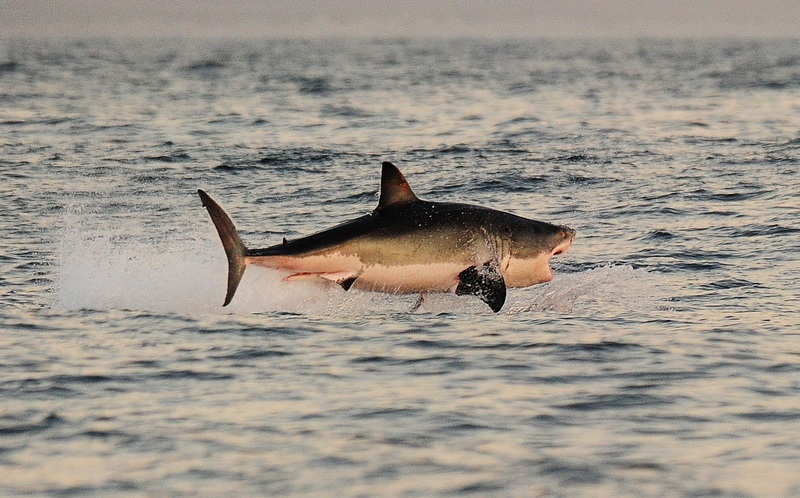 For instance, ISAF recommends avoiding the water at dusk and dawn, which are popular feeding times for sharks. In other words, sunsets — and Fourth of July fireworks — are best viewed from the shore.